Reading and Writing Redhead: Pretty Tough Plural Nouns, including a Freebie! Plural nouns can be so tough! I found a couple of neat ideas for plural noun practice and if you stay 'till the end of this post there is a freebie! Yay! Is it childs or children? Mr. Hughes has a nice post on this topic over at his blog An Educator's Life. Check it out here. I also found some nice pins on pinterest that led me to these two spots. Anchor charts are great! Click here for the first one! Click here for the second one, which is a blog post at the Teacher's Chatterbox.. I also created a plural nouns packet that has a bunch of activities that were helpful to my second graders. The packet is football themed and includes a noun hunt, plural noun bingo, plural noun matching activity and several practice pages. If you click the image below it will take you to my Teachers Pay Teachers store where you can snag it. You can also get it from my Teacher's Notebook shop by clicking here. If you'd like to snag a freebie, which is one of the activities from the packet click here to download it from Teachers Pay Teachers. Enjoy! 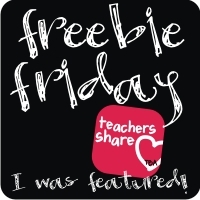 I also am linking up with Friday Freebies from Teaching Blog Addict and Manic Monday from Classroom Freebies. Be sure to head to their pages and check out all the other fun freebies! What a great idea for such a tough concept! Thanks so much! Thanks Andrea! You're the best! Thank you for linking up this week at Classroom Freebie's Manic Monday and my TBA Freebie Friday'! This is just terrific!